Is my cat a chocolate point Siamese? Just bought a house and realized that there were a litter of kittens that were born in a shed in our backyard. I found homes for her brothers and sisters but we just couldn't let her go. She warmed up to us almost instantly yet her siblings did not. She is very loving and energetic. I'm not exactly sure what breed she is, she looks like a choc point ... but not sure. Comments for Is my cat a chocolate point Siamese? We found a baby male over 20 years ago they could be twins. Just looking at her makes my heart skip a beat. Our Shasta was with us twenty years, had cancer. 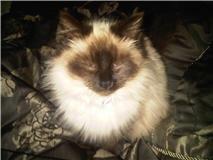 The vet told me when he was a kitten that he was a Himalayan mix - I miss him very much! We had him cremated so he can we with us forever. Boo Boo was his nickname and he loved it. We played hide and seek. He was very spoiled and loved. I would like to have another Siamese one day. We have a long hair tabby we reassured years ago. I know he misses Boo Boo too. There's something about their personality that makes them special. I wish you many years of joy and love with your special girl. They are very smart! 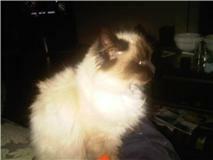 Your cat looks like a "Ragdoll" cat to me ... someone gave me one years ago and I thought it was a Siamese until a vet identified the breed. From the pictures I can't be 100% sure, but that's my bet. You can tell by the way they feel when you pick them up, just like a limp, rag doll with medium to long hair. An expensive breed if you were to buy one. If she is Siamese I would say she is a chocolate point. Hmm....looks a bit too fuzzy to be a Siamese I think. You may have a Balinese or even a Himalayan. Or possibly a Ragdoll. Well I took your advice and checked her paw pads and they are indeed brown, so that does help me out. Thank you very much ... I am so glad I found this website as I do not know much about cats (grew up mostly with dogs) but it has been very helpful and I am enjoying every minute with our little Talula Belle! To me she looks a bit more like a seal point than a chocolate point, but the way to tell for sure is to look at her paw pads. If they're brown she's a seal point, if they look pink she's a chocolate point. She's gorgeous with her long hair and Siamese markings, and lucky to have found a home with you.